The Kryptonite New York Standard Vs Fahgettaboudit: How'd They Differ? There’s nothing worse than losing something valuable, and for a cyclist there’s nothing worse than losing your bike. Unfortunately we live in a world where stealing happens so the kind of lock we buy for our bike is important. Today I’ll be comparing two popular locks by Kryptonite, the Kryptonite New York standard vs the Fahgettaboudit. If you're in a hurry I'd go for the standard over the Fahgettaboudit. The standard and that's exactly what I'm looking for. For my detailed review... Read on! The story of the Kryptonite company begins back in 1971 when Michael Zane invented the first U Lock. To raise awareness of the need for bike security he asked a cycling store to leave a bike in Greenwich village, secured by his U Lock. As expected, thieves soon stole all of the removable parts, but crucially, the frame was not taken. The bike ended up surviving 30 days and nights. It gained a bunch of publicity and sales started to take off. Kryptonite also offered an anti theft protection deal so that if a bike was stolen, they'd pay up. 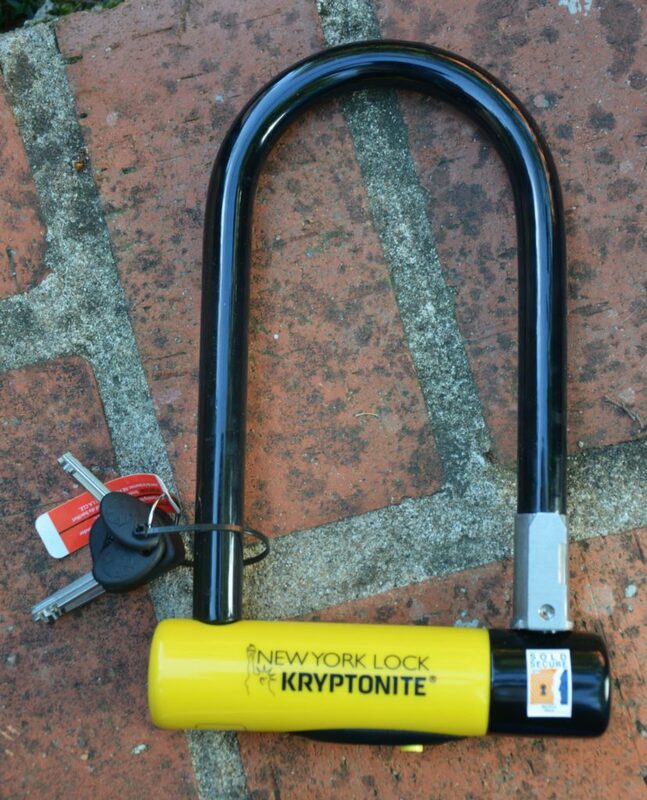 In 1994 in the Big Apple a rise in claims within 4 specific zip codes led to the creation of the New York Kryptonite lock. Another publicity test put a brand new bright green bike in the middle of the cities thieving area. Over 100,000 bikes were being stolen a year but this lock stood the test of time. It lasted 48 hours without being stolen. The standard Kryptonite is designed so that a cyclist can lock the frame and the wheel securely. This is different to the mini Fahgettaboudit counterpart. The Fahgettaboudit’s internal size is only 3.25” x 6” (8.3cm x 15.3cm). Try locking that through the back wheel and a frame, then you’ll understand the problem. 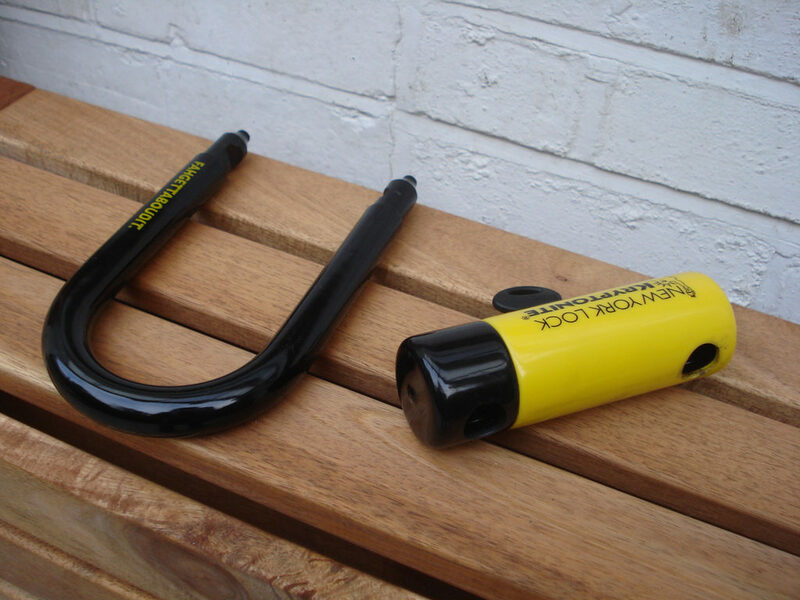 Nothing short of a grinder can cut through either product, so your average bike thief is going to need the heavy stuff if he wants your bike. Related Post How To Make A Frame Bag: Feeling Creative? This reviewer makes all of the points I already made in the above section. She loves the anti theft security and the added peace of mind it brings. She confirms that with this U lock you can usually attach the bike to a bike rack using your frame and your wheel, meaning you aren't going to get out of work and find a wheel missing. Always a good thing!She makes note that if she is keeping her bike somewhere over night she uses another lock so that both wheels can be secured. This is a good reminder, as it always pays to be safe, not sorry. 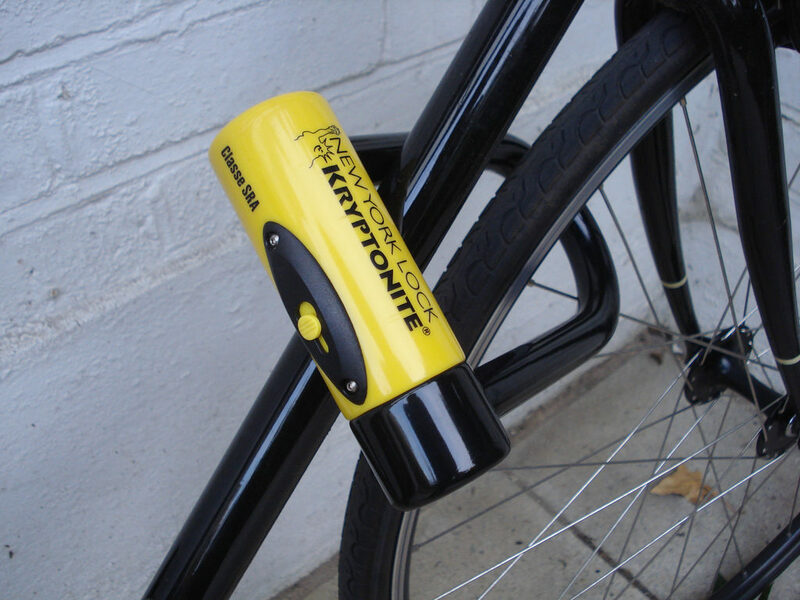 Since its inception, Kryptonite has had one thing on its mind, bike security. The creation of the New York Kryptonite lock is proof that when problems arrive the company is innovating to try and stay ahead of the curve, and keep thieves at bay. Since its entire brand and promise is about making sure your bike is left intact, all of its products come with an optional anti theft security package, and this lock is no exception. As with all Kryptonite products, the Fahgettaboudit lock boasts great security. It is a little thicker and more compact than the standard but lacks in versatility due to its mini nature. The small nature of this lock does, however, mean that it can be stashed easily in a small bag, unlike Kryptonites standard bicycle U lock. Just remember, it is heavier than its competitors, but that weight you feel on your back should be worth the peace of mind you feel inside. Compact so can be put on a pannier or in a backpack. Its oversized steel sleeve is thicker than competitors and more difficult to cut through. Really heavy and can’t be carried on a frame unless another part is bought. (An example is the Transit H Bar Carrier - can be bought from Amazon). Can only secure the bike frame rather than the wheel and frame. This reviewer has some interesting comparisons to make between the Fahgettaboudit and other locks. 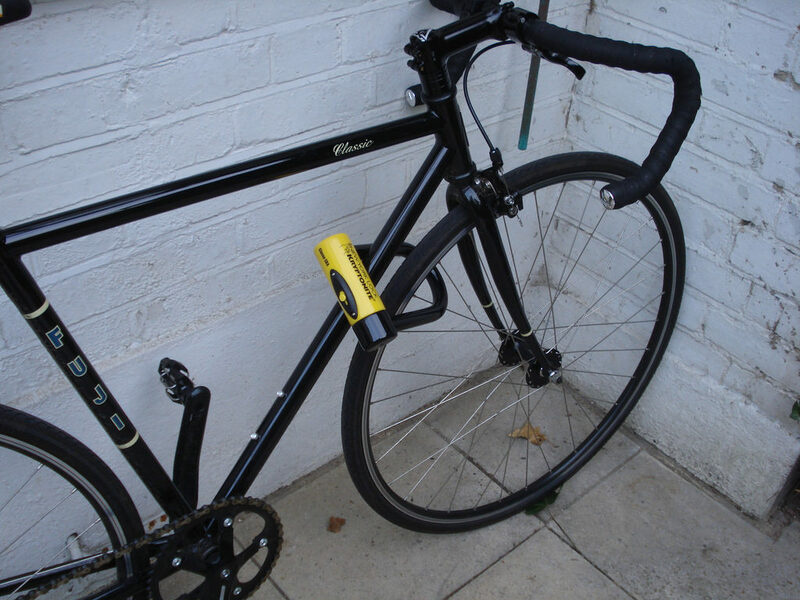 Firstly, he had a bike stolen while using an inferior locking system, since switching to the this his bike has been secure while others have had their bikes stolen from them. This is a good sign. He does mention that it was prone to rust when left in wet conditions. The rust caused the lock to jam. I had read elsewhere that it shouldn't do this, so keep that in mind when buying the product. Some reviewers had issues with the 15 day registration time for Kryptonite products. I checked, and actually, you have 30 days to register or your anti theft warrant is void. Please do keep remember this important fact. After all, other locks are also lighter. If you’re anywhere else in the world, this form of U lock is worth its weight in gold. Literally. Kryptonite offers a key safe service on both of these products. This is a big plus from my point of view. It's a recognition that sometimes customers will lose their keys and they want to help with that problem. What does it mean? Firstly, the product comes with 3 keys. Secondly, if any of these are lost you can replace them for free. To do this you should register your keys with Kryptonite as soon as you buy the product, and keep a record of their number. Kryptonite has a really simple online application form that can be filled out in the case of key loss. It's a one time service, however, so if you lose the second set you will have to pay up. This is Kryptonite's way of saying, "we offer the very best product." Both of these U locks can come with an anti theft protection offer, or ATPO for short. It's about $10 a year for this protection, and it will cover between $500 to $5000 worth of loss. A bargain! There are a couple of things you will need to bear in mind. When you buy your product you need to register within 30 days, and provide the following information. Related Post Giro Foray Vs Savant: Which One Should Project Your Noggin? The double deadbolt means that both ends of the “U” lock into place. The centre keyway is pretty standard on Kryptonite U locks, and is also crucial to this feature. Essentially, when you buy some U locks they only lock on one side, and not both. Every Kryptonite lock operates with the double deadbolt feature to improve security. Even if you don't buy a Kryptonite lock it's worth remembering that little fact when shopping around. Check out the video below by Silver Edge Locksmith which gives a review of the Fahgettaboutit. Why is this twice the cost but not as thick? Well, it's made from a different type of metal which is more compact and harder to cut through. The drawback is it costs twice as much as the Kryptonite products. Another upside to the Abus is it's considerably lighter. If you want even more security and have the money to spend then invest in the Abus. So it's easier to travel with, looks stylish and offers more security, but it just might burn a hole in your pocket. As far as mini locks go, this product is on the wide side. This means it is easier to actually secure on to your bike and get around a bike rack or other kind of post. It also costs a little less than the Kryptonite mini, but it isn't as secure. So you're basically trading out versatility for security. This isn't like the Abus which offers lightness and strength, it merely offers lightness for less strength. It's an alternative if you're looking to save a little money here and there, but I'd personally stick with the Kryptonite version which is considered the most secure of the mini brands. The Standard lock or the Fahgettaboudit? Personally, I’d buy the Kryptonite standard lock over the Fahgettaboudit. Although the Fahgettaboudit is more compact it doesn’t do what I want it to do, which is keep the whole bike safe, not just the frame. Considering the price of both products is virtually the same, I’ll always go with the one which keeps me safer.